This week at Just Add Ink the theme is to "Just Add Easter". What says Easter more than a cute bunny (well except chocolate maybe). Obviously, I must have liked the colour challenge last week as I have used the same colours again this week (they just happened to match the bunny my Sam is holding in the photos). Here is a close-up of the punch art bunny. I have sponged all the separate pieces to give him a little depth. The base of my layout is Tempting Turquoise cardstock topped with a sheet of paper from the Windsor Knot DSP set. I have cut a circle from Green Galore cardstock and stamped this with the Polka Dot background stamp. I have used my Scallop border punch and Curly Lable punch on some cardstock strips and added some So Saffron ribbon for a bit of detail. The flowers come from the So Tweet chipboard set and have just been sponged with ink. 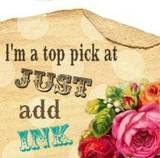 Don't forget to check out all the other entries at Just Add Ink. Your layout is lovely and I especially like the colourful punched rabbit. This is just TOO beautiful!! I love everything about it - not least of which the adorable punched bunny to match the toy one. Amazing!! Aaaaw! I'm feeling 'clucky'. That is one cute baby and a gorgeous scrapbook page. Gorgeous Lisa!! Love the colours the design everything!